After five days at sea the expedition reached the area where plastic accumulates. It was a calm day, and on deck two of her colleagues were counting large pieces of plastic as they floated by the boat. All of a sudden the duo called down to Rochman and others for assistance. “There was suddenly more plastic floating in the ocean than they could count but it was an accumulation of many small pieces,” said Rochman, a new assistant professor in the department of ecology and evolutionary biology in the Faculty of Arts & Science at the University of Toronto. Although she expected to see large piles of floating garbage, Rochman was shocked by what she was seeing. “When I looked over the bow of the ship, it looked like someone had sprinkled confetti all over the surface of the ocean,” she said. “The plastic pieces were the size of a pencil eraser and smaller. As an ecologist, the significance of what she was witnessing was striking. Rochman’s research at the School of Veterinary Medicine at University of California, has shown that fish that ingest plastic debris from the ocean suffer a “double whammy” – the plastic itself combined with the pollutants absorbed by the plastic while it has been floating in the sea. Her other work has found that plastic that made its way into oceans is finding its way up the food chain. In one study, Rochman found that one in four fish purchased from fish markets in Indonesia and the USA had anthropogenic debris, including plastic and microfibres in their guts. Rochman shared her scientific evidence at the Our Ocean conference last week in Washington DC. The conference brought world leaders together to learn about key issues in ocean conservation and to make real commitments to help conserve ocean resources. She says it’s important that scientists be included in policy-making discussions, so that scientific findings reach an audience outside academia. “I have found that when I put myself out there and make my work accessible to policy-makers, they are eager to hear what I have to say,” said Rochman. 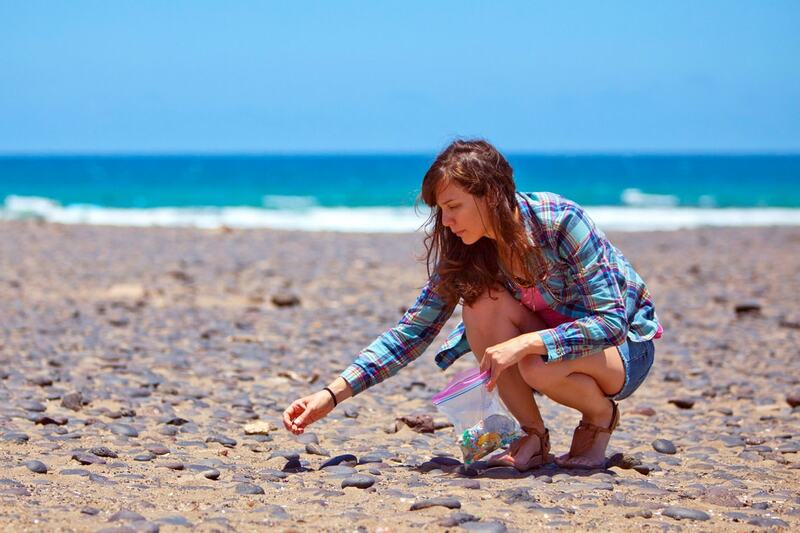 In addition to teaching and research at the University, Rochman has also created an outreach program about plastic debris, which she shared with young people around California during her graduate studies and her postdoc. She plans to do the same here in local communities. “The next generation is ultimately going to inherit our lakes and oceans, so I hope to inspire them to protect it better than we have in the past and present,” said Rochman. At U of T, Rochman is planning new projects related to microfibres entering the Great Lakes from our washing machines, plastic in seafood, microplastic in the Arctic and designing environmentally and ecologically relevant experiments to ask questions about how microplastic pollution impacts populations and communities of wildlife. Thinking back to that day on the ocean, Rochman says there are actions everyone can take today and in the future to mitigate the effect of plastic in the environment. Rochman says that even though many of us don’t live near a lake or ocean, that we are all connected to water. Every time we run our sinks, use a toilet, or wash our clothing we are contributing to what goes into our watersheds. She says it’s important to understand how we can protect our local and faraway waterbodies, as they provide major resources to everyone.